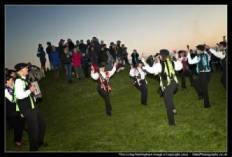 It's coming up the glorious first day of May and of summer - and Rattlejag Morris will be continuing a 26 year old annual custom celebrating May Day Sunrise at historic Laxton, Notts. Around c. 5.20 am our dancers and musicians will gather on the top of Laxton castle “motte and bailey” mound* overlooking glorious countryside close to the last Anglo-Saxon open field system. After singing and dancing in the sunrise, beer, tea and bacon butties will be available (for a small donation). We welcome all to join us and join in too; the sun has shown itself almost every year! If you fancy making a bit more of the visit, Stuart Rose, local farmer and historian (tel 07939 228353 or 01777 871702), will be starting a Dawn Chorus Walk around Laxton’s Anglo-Saxon open field system, meeting up at the Dovecote Inn, Laxton (NG22 0SX) at 5.00am and stopping off on the way to greet the dawn along with Rattlejag and friends. The historic castle site is usually closed to the public, but for this occasion access is allowed with permission from the local farmer. If you are thinking of coming along, wear sturdy clothing and be thoughtful of the villagers still asleep when arriving and departing. The field in which the castle mound is sited is up the track opposite the church (NG22 0NX), through the gateway at the bend, and northwards across the field. For more information, contact our Bagman Jayne on enquiries@rattlejagmorris or 0797673223. Visit the diary for more events.